I put through a Motion at last Northwest Community Council meeting on July 5th to get process going on re-zoning Highland Park. I suspect a Public Information meeting will be held in September. I will inquire about what that road is off HPR across from Yankeetown. There is a new 35 lot subdivision going in off Pockwock...not sure if the two are connected. There will be new intersection lights going in at Glen Arbour/HPR this month. The re-asphalting from Rockcliffe to Northwood will start on August 7th...will take two weeks. Will include a bike lane. When complete, this will be example of new standard road width which will extend all the way along HPR. I am pressing HRM for a schedule when sections can be anticipated. I will send the staff report with new standard for HPR. I have support of majority of Councillors and will bring forward to Council in September to reinforce its priority. I already passed Motions through NWCC (5 Councillors) and Transportation Standing Committee (8 Councillors). I have a website which should go live in next few days www.peterlund.ca along with Facebook elect@peterlund.ca I am also now on Twitter and Hootsuite. First and foremost, Thank you! It has been an awesome experience being part of Clean Across Nova Scotia and the Great Nova Scotia Pick Me Up, and there is much to be thankful for. Schools, businesses, community organizations, service groups, politicians and community members all jumped on board, and the positive experiences that have been shared with us have made all the work worthwhile. Octogenarians, students, military personnel and single mothers with strollers are only a few of the people who showed up on June 8 & 9, knit together by the knowledge that if we want the world to be a better place, we need to take action. It's no surprise that 'World Cleanup 2012' took off in Canada via Nova Scotia - people here understand community action better than most. We've been going through papers, tallying data, and are still reeling at how many people came out for Clean Across Nova Scotia. In total, we had over 8000 participants register more than 200 cleanups for this first-time event - which means that by June 9, through Clean Across NS and the Pick Me Up combined, we had already registered as many cleanups in 2012 as we had in the whole year previous - a truly inspiring result! Though the Great Nova Scotia Pick Me Up has run for years with great results across the province, we are still trying to wrap our heads around exactly what it means to be part of a global cleanup movement of almost 100 countries, and the first place in Canada to attempt such a feat. We will continue to promote and support community-based cleanups of all kinds as we move forward, and are excited at the potential for a bigger and better Clean Across Nova Scotia event next year. Already, groups from other provinces are wanting to get involved and do the same elsewhere in Canada, and a university professor from Ontario wants to have students study the process by which so many people got involved as part of her graduate curriculum. It really is amazing what Nova Scotians accomplished this spring, and people are noticing! Since this event is founded on community leadership and participation, your feedback is more than essential in planning for the next Clean Across Nova Scotia event - it's an absolute necessity. From Whycocomagh to Meteghan to Amherst to Preston, we need to know how to make the experience as relevant, meaningful and effective as possible, and have created a short survey as a first step towards that goal. There is much that we already plan on improving, but it's feedback from you that will make this an initiative shine. Some of you have been cleaning for decades, and have an incredible amount of insight into the problems of litter and waste, and how we might best deal with these issues. We need to hear from you! Once again, thank you so much for giving your time and energy to cleaning up our province. There's still much more to do, but there is power in numbers, and things will only get better in Nova Scotia as we learn to collaborate and coordinate our efforts to show this province the respect it deserves. It's amazing how quickly things can change for the better. If you would like to start a discussion about any topic related to waste and cleanups, please remember that we have our Facebook and Twitter pages active at all times. These digital technologies are no replacement for elbow grease and garbage bags, but they knit our efforts together, and allow us to share the successes, failures, reflections and inspiration as we continue our efforts. 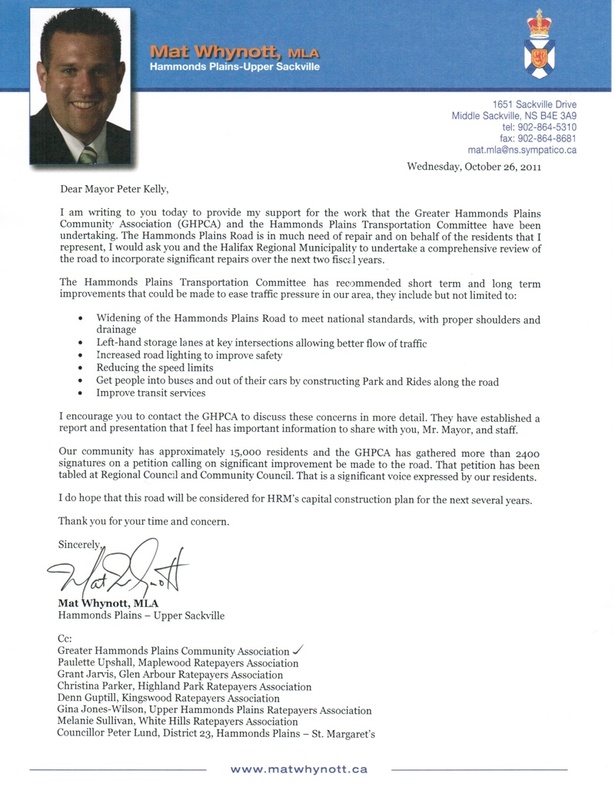 Please see the attached letter from MLA Mat Whynott to Mayor Peter Kelly in support of the work that the GHPCA is doing to bring attention to the state of the Hammonds Plains Road. Please do not hesitate to contact Mat’s office with any questions. Highland Park subdivision has a multi-purpose field located on Deepwood Drive, Hammonds Plains. The field is used on a regular basis and although there is designated parking off of the roadway, there is often no space available to accommodate all of the vehicles. Visitors are forced to park on the gravel shoulder and street which in turn causes a hazard to through traffic and pedestrians, as there is a sharp curve in the right of way at this site. We ask that this site be examined and ask that we work together to rectify the situation if at all possible. The Highland Park Ratepayers Association wishes to address some of the concerns shared by many residents who not only live in our subdivision, but also those who travel along Hammonds Plains Road, of the intersection of Hammonds Plains Road and Northwood. On March 23, 2010 at approximately 6:00pm, there was yet another collision at the aforementioned intersection. It is my understanding that a female passenger in one of the vehicles was quite badly injured and that two very successful careers have been drastically altered because of medical conditions resulting from the collision. There have been other serious collisions at the intersection in question in the past. The intersection is a major headache for those who travel through it due to the high volume of vehicles per day (in excess of 20,000 along HPR and 4, 000 Northwood) and lack of safety implementations. At a recent Directors meeting for HPRPA, it was brought to our attention that many residents in the subdivision have had friends, relatives etc., visit them who have commented that they have not noticed the stop sign at the intersection when exiting Northwood at night; or if it has been a quiet time with no through traffic during daylight hours and have gone sailing right across Hammonds Plains Road. This leads us to believe that the alignment of the road can be compared to that of Bluewater and Kearney Lake, which is of similar nature. It appears that the problem at the Northwood approach along Hammonds Plains Road is very similar to Bluewater Road and Kearney Lake. I do not know the history of the collisions at the Bluewater and Kearney Lake intersection, nor their severity, however one would surmise from Mr. Doyle’s response that there had been a history of collisions at this intersection, with the severity of a particular collision being the catalyst which finally lead to the implementation of the flashing caution signal. We are concerned that if nothing is done at the intersection of Hammonds Plains Road and Northwood intersection, there will be a fatality one day. The most recent collision was a close call from what I have heard. In addition to the alignment concern, residents remain completely frustrated about the lack of ability to cross the Hammonds Plains and Northwood intersection safely. Requests to have a crosswalk installed were denied citing that it is an enforcement issue. However, even though the Motor Vehicle Act of Nova Scotia quite clearly states that motorists must yield to pedestrians in an unmarked crosswalk at intersections such as this, the section of law in this particular case does not work. It is illogical to expect motorists who are travelling along an uninterrupted flow of a 5km stretch of road, in an 80km/h speed limit with two left hand storage lanes to come to a halt to allow pedestrians to cross the road with no warning whatsoever. I tried it once and almost got rear ended. To enforce this particular legislation would be foolhardy and is not feasible in this extenuating circumstance. There needs to be some other solution. If HRM traffic Authority is still opposed to implementing a crosswalk at this intersection, perhaps it could at least implement a flashing caution signal in order to alert motorists of impending activity. In light of this concern, we ask that Traffic Authority investigate the alignment of Hammonds Plains Road and Northwood intersection and compare it to the Bluewater and Kearney Lake Road intersection. The 1981 Municipal Planning Strategy had recommended a flashing caution signal to be installed at this intersection and traffic wasn’t anywhere near the volume then as it is today. Clearly something needs to be done. The picture below was taken at the scene of the March 23, 2010 collision. I am also attaching a letter from a resident of White Hills, Shane Costantino, who apparently narrowly avoided being involved in the collision. He tracked me down in order to ask what he could do to express his concern about the safety of Hammonds Plains Road, as he had heard about efforts of the community in trying to get something done to improve safety. He supplied me with a copy of his letter to HRM staff and government officials for my records.